Okay well its a system that makes it so you can't use all of your skills at once while in battle. Instead you have to equip them. Now here's the catch. 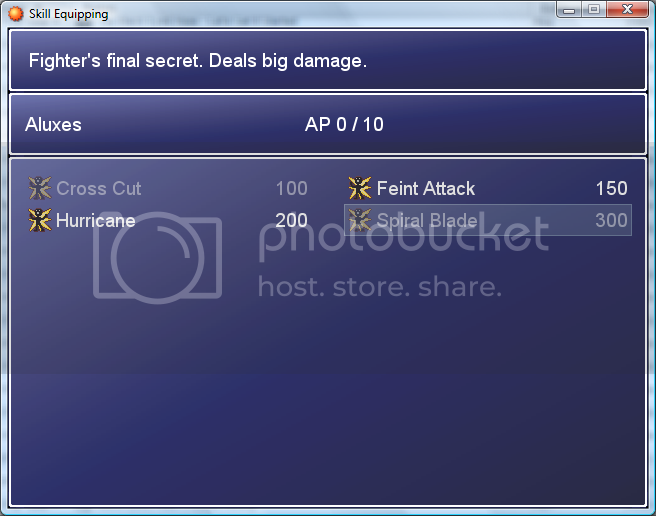 Every skill has its own "ap" so when its equipped it takes some of the actor's ap. That way you can't use all of your skills and it adds some uniqueness to the game. # once while in battle. Instead you have to equip them. Now here's the catch. # Okay so these could be confusing but lets try and get through this. # And do all of you're configuration there. # Now theres some stuff you need to know. # $game_actors[id].clear_skills to unequip all skills and give all ap back. # Just to make it a bit easier. # equipped skills as well to avoid any problems. # To open the skill equipment scene use this. # To tell if a skill is equipped or not you'll notice the text is greyed out. # That means it equipped. If its white it means it can be equipped. # In the scene though to equip/unequip things just press the action button. # Well thats about it. # Enjoy and give credits. # defined below at # Config Starting Ap. # defined below at # Config Ap Costs. # DisplayAP = Will display AP costs instead of SP in the scene. # Set to true if you wish to use this. Use false otherwise. # ExitScene = The scene it goes to when the Skill Equipment closes. # be equipped at the same time. # Added stuff for Skill Equipping. # Copy of Window_Skill but just slightly different. # Window uses for equipping skills. # Window used to display AP and Actor name. # Just slightly modded the main method. # The scene that deals with equipping skills. The Skills, which are added by a materia aren`t appended in the Skill Equipment Screen. Nice, don't know about uniqueness though Does it work with Blizz ABS? Shouldn't white be equipped and greyed out be non-equipped? I wouldn't call it AP, just because of the EQUAP skills in Tons of Addons. well it is changable and I named the actors variabls differently so its ok. Sounds still like EQUAP. ._. Ah, then I misunderstood the concept. Nice script. yeah I noticed when I put it in my game. Anyways yea this didnt take long to make but I feel there should still be something added...its probably just me but anyone have any suggestions? because you only have ap update during the equip scene. solution: move ap change to the equip_skill method. now try it I think I fixed it for sure. I'll have to try it out! !